Clifton Tidd's father, S. D. Tidd, and step-mother, Minnie Colbow Tidd. 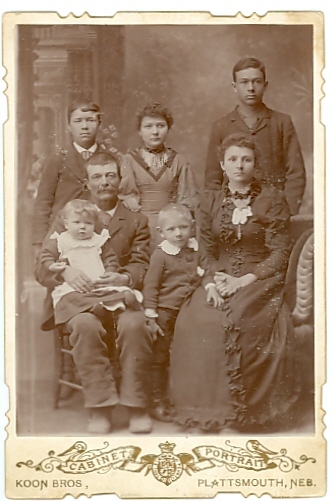 Back row, left to right: Clifton, Nancy, Charlie, children of S. D. Tidd and Mary Cutlipp Tidd. Robert, sitting on S. D.'s lap, belongs to S. D. and Minnie. Archie Colbow, standing between, is Minnie's son. Photo by Koon Bros., Plattsmouth, Nebraska, c. 1892-93. Following is the W.P.A. Biography of Clifton H. and Anna Poster Tidd, as given by Anna, on July 29, 1937. Johanna Michalke recorded the interview. Clifton Tidd was born November 23, 1877 near Columbus, Ohio, the son of S. D. Tidd and Mary Cutlipp Tidd, both natives of the United States. A-1 Mattie was born in 1871, a twin to Martha. Died in infancy. A-2 Martha was born in 1871, a twin to Mattie. Died in infancy. A-3 Charles was born November 21, 1873 in Piketon County, Ohio. He came to Little Falls where he worked as an electrician for many years. He was married and had ten children. He died Oct. 10, 1935. A-4 Thomas was born in Ohio in October, 1875. He married, and has three children. He is farming in Illinois. A-5 Clifton, subject of this sketch. A-6 Nancy was born in Ohio in 1879. She married Thomas Short who is now deceased. She has five children and lives in Chicago, Ill.
A-7 Robert, a half-brother, was born in Nebraska about 1892. He now lives at Pine Center. He is married and has one child. He operates a resort. Clifton H. Tidd lives in Little Falls where he is a decorator and sign painter. He is well known throughout this community for the fine quality of his work. Mrs. C. H. Tidd, nee Anna Poster, was born March 26, 1882 in Pierz, Minnesota. Her father was born in Germany in August, 1856. He came to the United States with his parents when he was six months old. On coming to Little Falls he was engaged in the draying business previous to working for the Northern Pacific Railway Company in the Building and Bridge Department. He has been in Little Falls since 1887. He now lives with his daughter, Mrs. C. H. Tidd in Little Falls. B-1 Anna, subject of this sketch. B-2 Catherine was born Nov. 17, 1886 in Little Falls. She is single and is living with her sister, Mrs. C. H. Tidd. B-3 Fanny was born April 24, 1892 in Little Falls. She married Harry Larsen in 1919 and lives in Minneapolis. She has no children. Mrs. C. H. Tidd came to Little Falls with her parents when she was five years old and has lived here ever since. She attended grade school and two years of highschool (sic) in Little Falls. 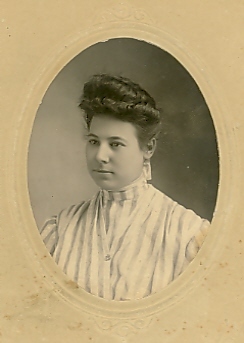 At the age of seventeen years she started work as a clerk in the St. Paul Store in Little Falls. Here she worked eight and one-half years, until her marriage to Clifton H. Tidd which took place October 15, 1907. The ceremony took place at the home and was performed by the Reverend Farrel, Methodist Minister. C-1 Margaret Catherine was born March 15, 1914. She attended grade school and graduated from the Little Falls Highschool. She also had one year at Hamline University in St. Paul. At present she is doing public stenography. Mrs. Tidd operates a hat and dress shop in Little Falls which she opened in 1919. She is located on Broadway East and doing a fine business. Mrs. and Mrs. Tidd and daughter attend the Methodist Church in Little Falls. They own their home at 510 2nd St. N. E. Mrs. Tidd belongs to the Professional and Business Women’s Club. Anna Poster Tidd. Nelson photo, Little Falls, Minnesota, undated.